Now you never have to lose sight of your boat! 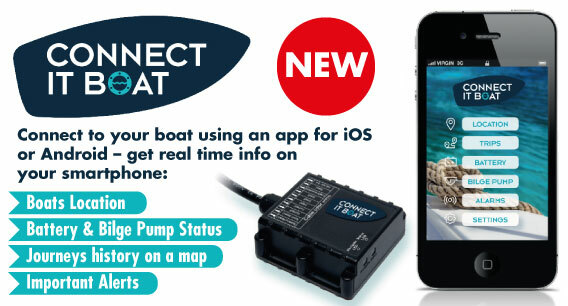 Connect IT Boat allows you to stay remotely connected with it through Android or iOS App - with everything you need to know at your fingertips! This DIY install device allows you to track: the location of your boat, the status of the battery and the bilge pump, trip tracking in a convenient list of all trips displayed on your smartphone. This handy app gives detailed and smartly presented info on Location - view in real time exactly where your boat is. Trips - provides a record of all the trips taken on the boat. Battery - get data on the battery level allowing 24 hour comparison. Bilge Pump - full data on pump operation with push notifications to your smartphone whenever it starts up. Alarms - Set alarms and push notifications for Low Battery level , bilge pump operation, ignition start or movement of your boat. The CIB package includes - 1 x Boat Monitoring device, Connect IT boat App for Android and iOS, Connect IT boat web portal, EU SIM-Card, 12 months subscription. The Connect IT Boat packages are now available for immediate delivery from Bainbridge Marine. The product is ideal for conscientious boat owners, hire fleet operators, charter companies etc. thanks to its simple and easy fitting coupled with detailed monitoring of exactly where and what your boat is up to!